Last week, I began with the simple pendulum, so go back and reread that post before starting this one. (I’ll wait here; no rush.) Two things we assumed last week: that the pendulum swings through a small angle, and that air resistance is negligible. Let’s relax each of these assumptions in turn. 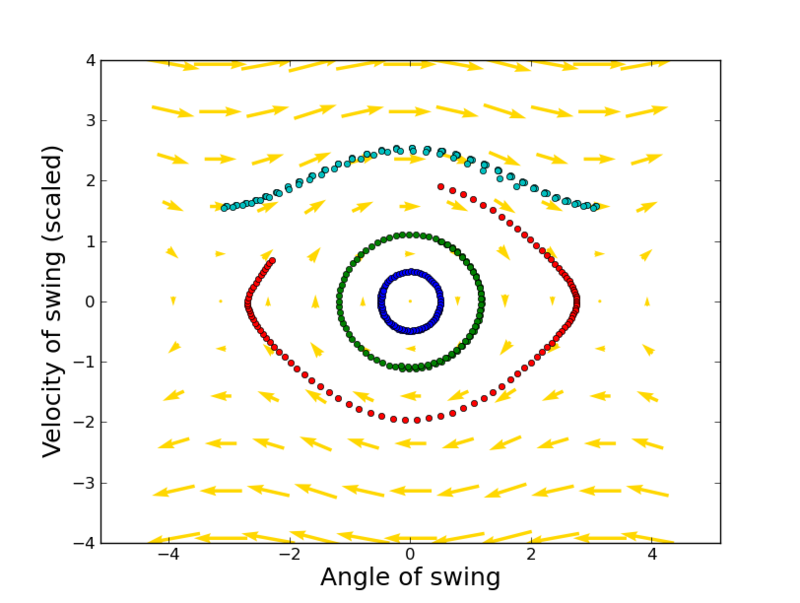 You can start the pendulum swinging in three ways: lift the bob up to some angle and let it go, or start it at its lowest point and give it a push, or start it at some other angle with a push. In other words, there are two different physical quantities that dictate how the pendulum swings: its initial angle and its initial speed. In fact, if you give the pendulum a hard enough shove, it can rotate in a full circle. To figure all this stuff out, physicists use a type of plot known as a phase diagram. (The “phase” here is not to be confused with phases of matter, like the transition between liquid water and ice, which are also mapped on something called a phase diagram. Physicists can get confusing sometimes.) In a phase diagram, the angle of swing is plotted on the horizontal axis and the velocity of swing is plotted on the vertical axis; negative numbers just mean the position is on the left of equilibrium or the bob is moving to the left. The dark blue circle is what happens if we just release the bob from rest. It traces a small circle, and will keep tracing that circle forever in the absence of air resistance. The period of oscillation (which I wrote about in the previous post) is the length of time for the trajectory to repeat itself. To get the green circle, we give the pendulum a bit of a push, but not too much, so it never swings too far up. For the red dots, we give it a big push, but not quite enough for it to reach the unstable equilibrium point at the top of the swing. However, it slows waaaaay down when it gets near the top, which flattens the circles we saw in the blue and green trajectories into something more eye shaped. The cyan trajectory is if we give the pendulum a big shove, enough that it will keep turning in circles. However, it’s not going to swing at a steady speed, which is why the line isn’t straight. Close to the unstable equilibrium position, it will be moving the most slowly, while it will be moving fastest near the stable equilibrium position at the bottom of the swing. I also included yellow arrows that indicate what a pendulum having that particular position and speed will do in the future. The longer the arrow, the more quickly it will transition to its new point in the phase diagram. 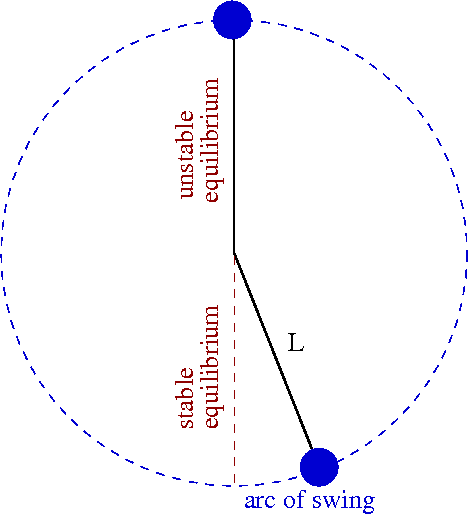 There is a special point right in the middle where the position and the velocity are both zero: this represents the pendulum hanging straight down with no motion — in other words, at stable equilibrium. I realize this is probably a new way to visualize motion — typically, the position is plotted as a function of time. In this case, though, because there’s repetition, we can convey more information by sort of taking time out of the picture. 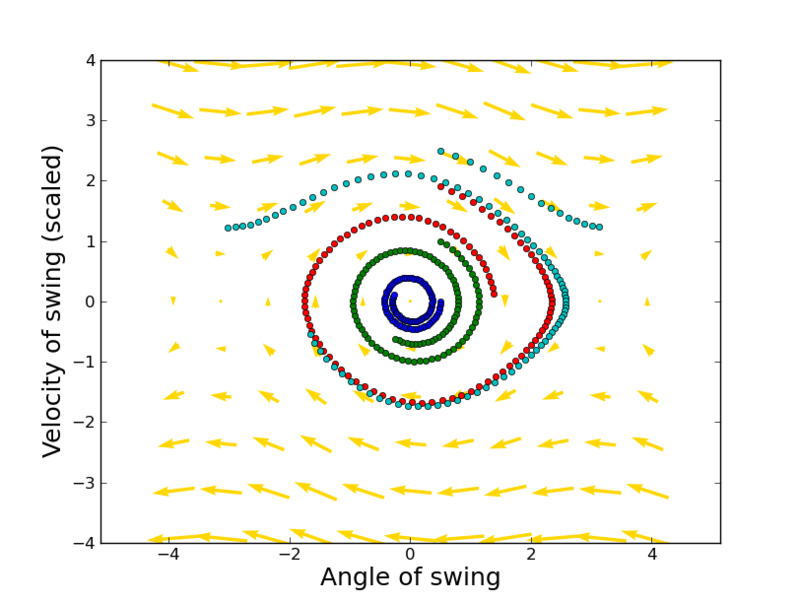 Each dot is a snapshot in time, but if you look at the whole trajectory, you see that pushing the bob at different speeds produces different types of motion. That kind of thing is hard to see with traditional position-vs.-time plots. Air resistance depends on the an object’s size, shape, and mass. A heavy, compact object will experience relatively little resistance, while a large, light object will experience a lot. Adding air resistance to our pendulum model while leaving everything else the same has a simple effect: all trajectories will end at the stable equilibrium point! Instead of circles, eye shapes, and wiggly lines, we get spirals. The amount of air resistance is pretty small in this picture, but cranking it up (by using a lighter and/or larger bob, or even by immersing the bob in some liquid) may make any kind of oscillation cease! Air resistance (along with friction) explains why old-fashioned pendulum clocks need winding up, or some other method to keep them going. Even the best pendulum will experience some air resistance, so the clockwork mechanism helps keep the bob swinging back and forth at a regular rate. Things can get even more fun if we add a driving force to the pendulum, but I’ll save that for another day. The next installment will connect pendulum oscillations to quantum mechanics and other physical systems that don’t at all look like a mass on the end of a string.